AMS Spectral UV - A Baldwin Technology Company manufactures LED UV curing systems that are used to solidify or "dry" printing inks, coatings and adhesives, among other applications. Here you can learn a bit about the history of UV and LED-UV curing technology; the benefits UV-LED curing systems bring to printing, converting and other industries; and answers to some frequently asked questions regarding the LED UV curing process. Ultraviolet (UV)-enabled curing processes have existed for decades, and were first used in the the 1960s for securing coatings onto furniture. As explained by Wikipedia, UV-based curing is "a low temperature process, a high speed process, and a solvent-less process – to cure is by polymerization rather than by evaporation." In layman's terms: curing is different than drying, and when it comes to inks, adhesives and coatings, it is an instant (or near instant) process that doesn't involve matter changing from a liquid to a fixed-in-place solid by evaporation (of water or solvents) or by absorption - instead, light causes photo-reactive substances to undergo a photochemical reaction and solidify instantly. 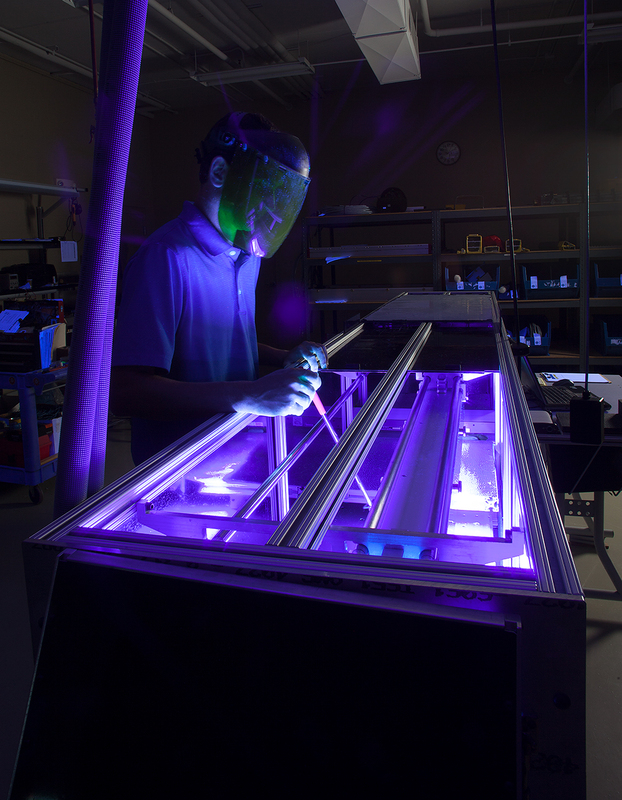 Traditional UV curing employs mercury arc lamps to create ultraviolet light, which causes UV-reactive inks, adhesives and coatings to undergo polymerization that converts them from liquid to a solid when exposed to UV light. Ideally, they become securely stuck to the substrate onto which they were printed - a.k.a., they are securely cured, with adequate depth of cure (and the cure isn't tacky, sticky or flakey). Mercury arc (H type) lamps are widely deployed as UV curing solutions for printing and other markets - they work well and have been around a long time - but they have their downsides: they produce ozone and require exhaust systems to maintain air quality; they use a lot of energy and create a lot of heat; and they require mercury-arc bulbs, which must be disposed of at a cost and have a long-term environmental impact and are facing ever-increasing monitoring due to this fact: the European Union’s recent Restriction on Hazardous Substances II (RoHS II) regulation bans the use of heavy metals including lead, mercury and cadmium in industrial products. Semiconductor LEDs being used to create UV light is a relatively new process that many printers and converters are still learning about. Asif Khan can be credited with proving the viability of LEDs for creating ultraviolet light in mid-2001, when his research group at the University of South Carolina created an LED that produced appreciable amounts of UV light at 340nm. The USC group managed to develop LED UV devices that emitted UV-A, UV-B and UV-C light over the course of their research, proving that there was still room for new development in the arena of LED light and its potential uses. In 2009, Air Motion Systems (now AMS Spectral UV - A Baldwin Technology Company) commercialized a high-intensity, solid-state UV LED curing system designed for the extremely fast curing speeds and high curing intensities/peak irradiance needed for sheetfed offset printing. The development of LED-UV (or UV LED) provided an alternative to conventional UV systems for solidifying inks, coatings and adhesives as part of the printing process, and revolutionized the options available to commercial printers for drying their inks. AMS Spectral UV - A Baldwin Technology Company maintains manufacturing facilities in River Falls, Wisconsin in the United States and in Slough, England in the United Kingdom. 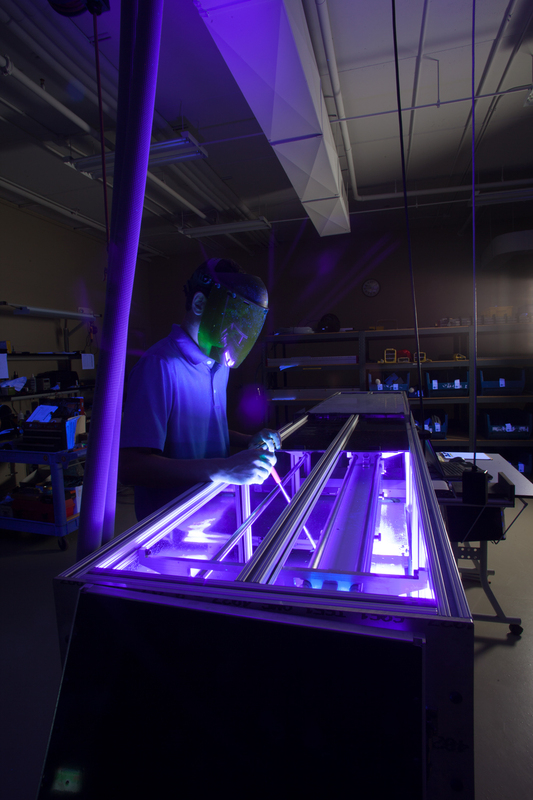 Both locations produce LED-UV and conventional UV curing equipment that is built to the most rigorous engineering standards, designed to withstand nonstop use in printing and other industrial environments. It takes teams of skilled craftsmen to produce our systems, each of which is built to the exact requirements of the customer. 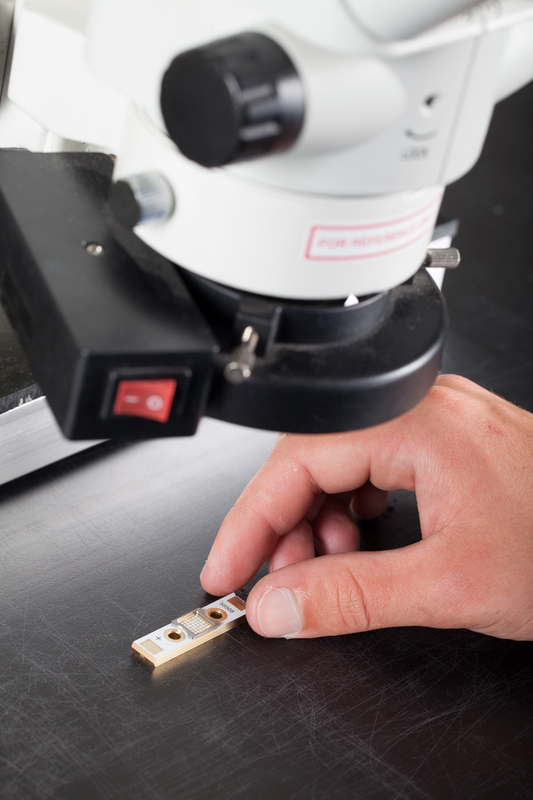 Both of our manufacturing facilities feature in-house engineering teams who oversee all of our projects, ensuring that you get the right piece of equipment for your setup. In-house machining, electrical and assembly teams maintain top standards when producing our equipment - check out the gallery below to see more images from the manufacturing process.